"Maybe it was never really mine in the first place." 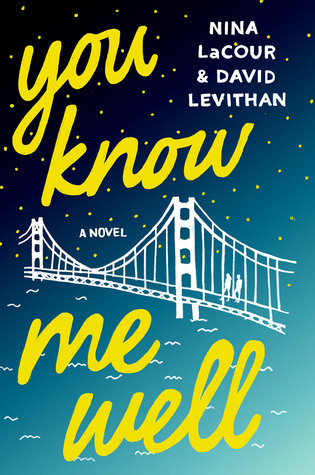 You Know Me Well catches my attention right away when I found out David Levithan was one of the authors. I love his books Every Day and Another Day, as for Nina LaCour, I've seen her book Everything Leads To You. I always wonder what was that all about and I made a mental note to read it soon. When I saw the book cover I fell in love with it right away, eye-candy and it's the type of book where you can just stare at the cover for a long time. Now for my review; I could say this book fall on a genre that something I don't read often, I don't have a problem with LGBT books. To be honest it is a good challenge for me since I'm trying to read book/s with a different genre than the one I am used to reading. I wonder what would happen if I stopped walking, if I let the crowd fill up the space between us. Would he notice? Would he wade back to find me? Or would he keep going, because forward is his destination and I am not? "There are so many ways to let people down, not nearly as many to get it right." Kate and Mark met in a bar, it was an unexpected moment. Things happened so fast between them and since then, they decided to be each other's knight in shining armor. Their friendship is something you can't compare to anybody. Despite their differences they accepted and supported each other, they were behind each other's back even when they think they were all alone. Kate has a different story to tell, Mark too but both of them moved on and did an amazing job. "when you're a teenager there?s this rule: You aren't supposed to make decisions based on love. You are supposed to tell your heart that it's an immature and fickle thing. You're supposed to remind yourself of Romeo and Juliet and how badly it turned out for them."